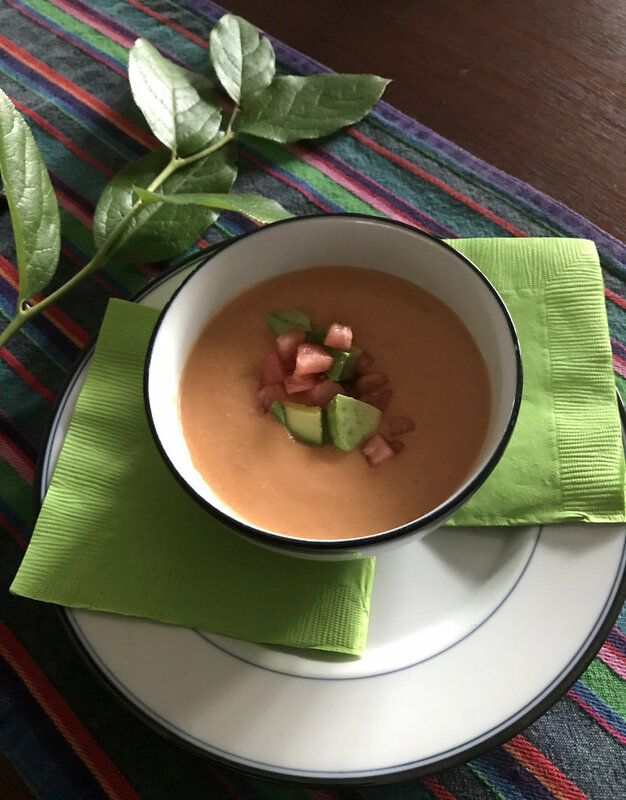 Tomato Watermelon Gazpacho — Good Food Makes Me Happy! Another fresh and vibrant cold soup for those end of summer tomatoes. A Vitamix or other high powered blender is useful for this recipe — add all of the ingredients and blend for a minute or two. If you like more of a kick, feel free to add a teaspoon of jalapeño or serrano pepper to the blender. After blending, chill in the refrigerator for at least an hour before serving so that it’s nice and cold. The flavor is even better the next day! The recipe below serves at least 4. Put all of the ingredients, except for the avocado, in a high speed blender (Vitamix) and blend until smooth. Transfer to a covered bowl and chill in the refrigerator for at least an hour. To serve garnish with chopped watermelon, chopped avocado, a sprinkling of freshly ground pepper, and a drizzle of good quality olive oil. *Persian cucumbers have a thin skin and do not require peeling. I get mine at Trader Joe’s. Otherwise, you can use an English cucumber which also doesn’t require peeling.